A guide to India’s tea producing regions…and its tea! Discovered almost 5,000 years ago in China, tea has gradually evolved from its original medicinal form to what is today the most popular beverage in the world (after water). The British introduced tea into India in the early 1800s as a strategy to break China’s monopoly. At the time, the British offered land to in Assam to settlers that agreed to cultivate tea for export. While drinking chai has become a daily routine throughout India, the ritual of drinking tea was originally reserved for the more privileged Anglicised Indians. Tea only moved mainstream as late as the 1950s after a strong push by the India Tea Board with its advertising campaign. Located in the north east of India, Assam is noted for its low altitude, warm weather, high rainfall and rich soil conditions. These combine to make it the world’s largest tea growing region; both mass market and more premium teas are widespread in Assam. Tea: dark, rich and full bodied with flavours ranging from malt to caramel to honey. Due to its strength, it is usually consumed with milk and sugar. Located in the foothills of the Himalayas, Darjeeling is considered to produce the finest tea in the world, often referred to as the “champagne of tea,” accounting for only 1% of tea in India. Darjeeling tea is known to be grown in a cool climate and among rocky slopes, commanding the highest prices in the world due to the scarcity of this type of tea and difficulty of harvesting the tea in the hilly terrain. Tea: golden in colour and mild in taste with a delicate, floral “muscatel” flavour. Usually consumed without milk or sugar. The black tea leaves are shades of gold, brown, green and white. 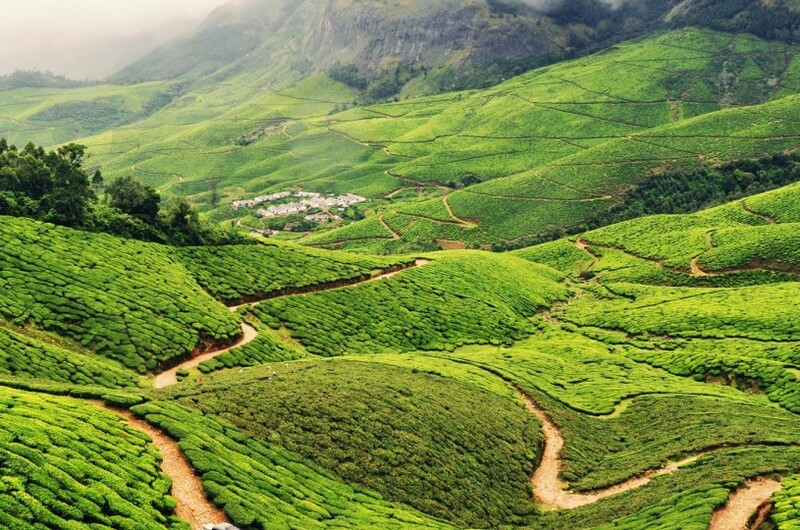 Located in Kerala, Munnar is a hill station and is often known as one of the most beautiful tea regions in the world. It is also home to some of the highest tea estates in the world. Tea: medium bodied with fruity flavours and a distinct lingering sweetness. Located at the south western most tip of India, in Tamil Nadu, the Nilgiris (meaning “blue mountains) are characterised by grasslands and dense jungles. Undulating hills that allow tea to be grown at altitudes ranging from 1,000 metres to 2,500 metres, coupled with warm climate and moist conditions produces tea all year around. Nilgiri tea is generally cheaper than other Indian teas, usually used for blending in tea bags. Tea: a subtle, fragrant tea with floral flavours, often used as a base for blending with stronger teas. Generatea blends. We thank the India Tea Association in helping our education in tea. Travspire currently offers experiences in Munnar – if interested, you can book here or contact us for a customised trip!